1. For Discipline Code - 01/06/11/16/21-Trade Apprentice (Fitter) -Matric with 2(Two) year ITI(Fitter) course. 2. 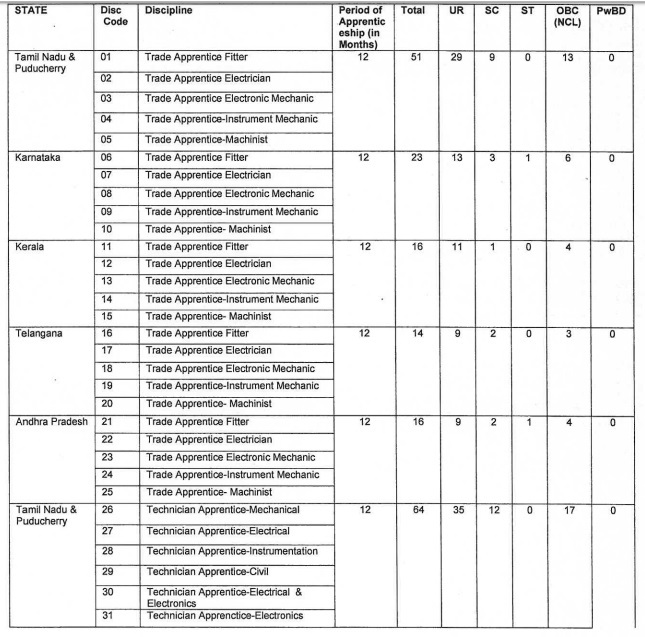 For Discipline Code - 02/07/12/17/22- Trade Apprentice (Electrician)-Matric with 2(Two) year ITI (Electrician) course. 3. For Discipline Code - 03/08/13/18/23- Trade Apprentice (Electronic Mechanic) -Matric with 2(Two) year ITI (Electronic Mechanic) course. 12. 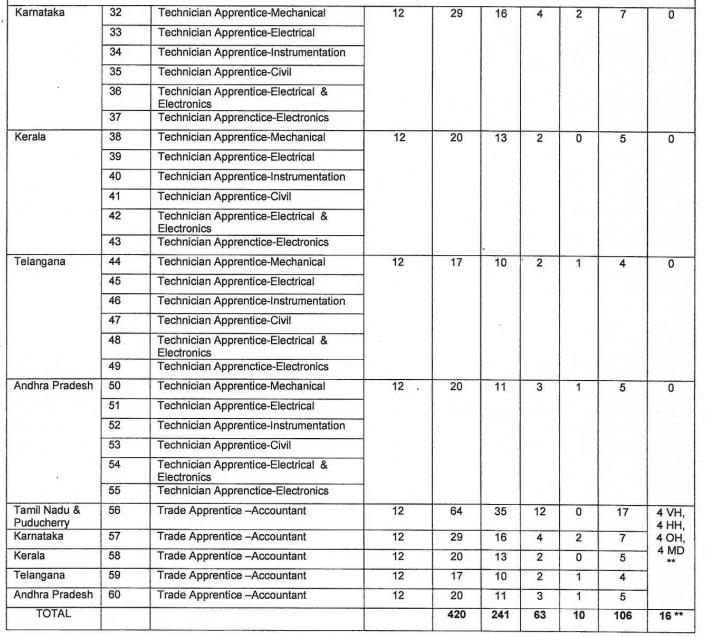 For Discipline Codes- 26 to 55 - Technician Apprentices- 3 years Diploma in Engineering in the relevant discipline from a recognized Institute/University with minimum of 50% marks in aggregate for General and OBC and 45% in case of SC/ST candidates against reserved positions. as on 31.12.2018 (Relaxable by 5 years for SC/ST i.e. up to a max of 29 yrs., 3 years for OBC i.e. up to a max of 27 yrs., for the posts reserved for them). 1. The candidates meeting the prescribed eligibility criteria may apply online from 18.01.2019 from 10 am to 10.02.2019, 5 pm through the link which will be provided in our corporate website www.iocl.com(Careers-> Latest Job Opening-> Engagement of Technical and Non Technical Trade & Technician Apprentices in Southern Region (Marketing Division)-FY 2019-20. Only Online mode of applications will be accepted. 2. After filling up the online application ,the scanned copy of the latest colour photograph, scanned copy of the documents namely proof of date of birth (Xth Std certificate/marksheet), prescribed educational qualification, caste certificate as applicable and signature to be uploaded without fail. In the absence of any single document, the application shall be summarily rejected. Eligible candidates will be intimated by e mail/sms for downloading admit card for the written test. 3. Those applications which are incomplete/not uploaded with self- attested copies of certificates /not in line with the terms & conditions will be liable for rejection. 1. The Selection process would consist of two stages i.e. Written test. The Written Test will comprise of 100 questions and shall be of 90 minutes duration & would mainly comprise of objective type questions.. The questions would be in bilingual i.e. English & Hindi. The written test would carry a weightage of 85% and the weightage for interview will be 15%. 3. The candidates will have to qualify successfully through each stage of the selection process i.e. Written Test and Personal Interview (Minimum 40%, relaxable by 5% for candidates from SC/ST/PwBD categories against reserved positions) and Pre-employment medical fitness for being adjudged suitable for engagement. Candidates are advised to ensure that they are medically fit as per Indian Oil's pre-employment medical standard. Candidates are advised to go through the "Guidelines and Criteria for physical Fitness for Pre-employment medical Examination before they commence the application process. The guidelines are available in the following link : https://www.iocl.com/PeopleCareers/Careers.aspx-> Pre Employment Medical Format.